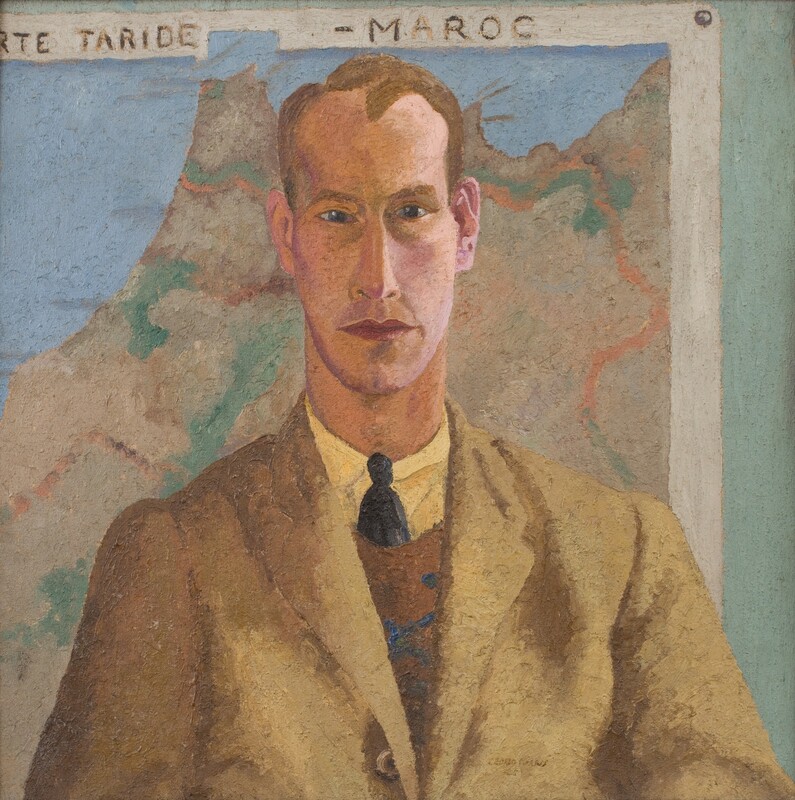 Richard Morphet, Cedric Morris, exh. cat. Tate, (London: 1984) p.43 ill. col. There was no more significant person in Cedric's life than Lett. The present work, therefore, is one of the most important portraits he ever produced and of the three paintings of Lett Haines exhibited in the Tate retrospective, this is most significant. The first, from 1919 shortly after their meeting, has a furtive tone dominated by acute angles. The latest of the three, completed in 1928, adopts the blank background and direct address that would become characteristic of Cedric's portraiture. The present work from 1925, temporally positioned between these closely comparable paintings, is the largest and is remarkable for its exception psychological insight and unusual backdrop: a map of the north west coastline of Morocco; Cedric and Lett having recently returned from a trip to North Africa. Raymond Mortimer wrote in complimentary terms of Cedric's portraits "not speaking but shrieking likenesses". The volume of character and personality sensitively registered in Cedric's portraiture is undoubtedly high, but Mortimer's comment says little of the self-contained modesty and wilful naïvety with which the artist captured his sitters. The present work typifies this balance between complex revelation of Lett's personality and simplistic means of the achievement. It's ratio is square, with Lett placed centrally within the frame. His expression is blank but his eyes bore directly into the viewer. His right eye is hardened by shadow cast as light strikes the left side of his face and in turn softens his left eye. The dark band of Lett's tie reinforces the central, anchored demeanour, corresponding with his distinctive long nose. The peculiar paint texture of the portrait is far from incidental. Two years earlier, Cedric painted the entirely abstract Experiment in Textures (1923; Tate). An exploration of organic abstraction evoking vegetal or bodily forms in subterranean space, this work directly instructs the controlled paint surface seen in the portrait of Lett. The two works also share concerns of absorption and penetration. Lett's piercing stare, though outwardly striking, also invites communion with the viewer, and the map tacked up as a backdrop operates as an abstracted, plunging, recessional space. These issues combine to situate the present work as not only the most visually impactful of Cedric's portraits of Lett but also the most conceptually intriguing. It is the apotheosis of what Morphet describes as the hallmarks of Cedric's best portraiture: "frontality, piercing intensity, rich and detailed surface texture, observation of sophisticated urban life." It also carries the remarkable parallels between Cedric's work and that of the German Neue Sachlichkeit, which he saw on a visit to Berlin in 1921/2. Lastly, in its figurative representation and care for the materiality of paint, this portraint of Lett casts forward to the young Lucian Freud who would be profoundly inspired by Cedric in the forties. He described how "Cedric taught me to paint and more important to keep at it. He did not say much but let me watch him work. I have always admired him and everything about him."